Scanspeak D2905/950000 Tweeter, a Classic Range Tweeter. A very popular design for a long time, the D2905/950000 features a specially hand-coated 1" textile diaphragm resulting in a smooth, detailed and very transparent sound and low levels of distortion and resonances. Low Fs. Aluminum face plate. 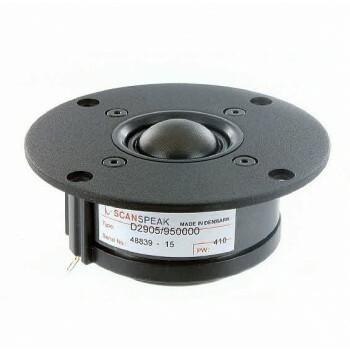 This tweeter has a low resonance rear chamber, and a light ferrofluid is used.